Our kitty Josie developed a significant allergic reaction which resulted in very large unsightly lesions on her face and body. 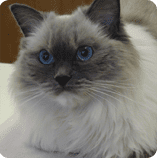 The cause of the reaction was unknown and when we took her to Boise Cat Clinic, Dr. Roller took immediate action recognizing the severity of the situation. Dr. Roller considered ALL possible causes and detailed each treatment option in a way we could understand. When Josie was in the capable hands of Dr. Roller, we felt such relief and had the utmost confidence in Dr Roller’s abilities. Dr. Roller’s professionalism, kind manner, and feline experience keeps us coming back. She is and will always be Josie’s primary care physician. Today, the lesions are gone with zero evidence they were ever there and we haven’t seen any flareups since.